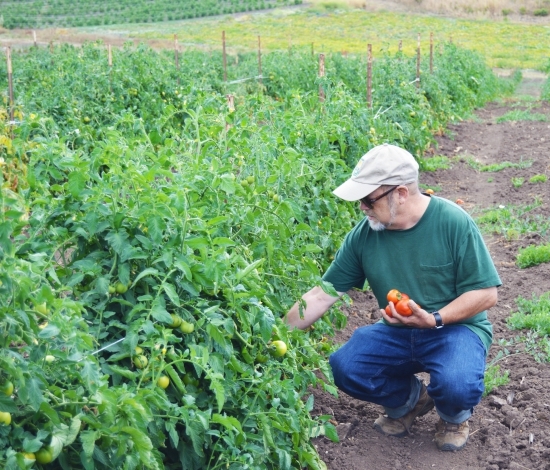 Lipson, who chaired the Organic Working Group at the U.S. Department of Agriculture from 2010 to 2014, with some of the dry-framed tomatoes grown at Molino Creek Farm. Organic is everywhere. Since the early 1970s, the label has moved from an agricultural outlier to the American mainstream, from the local farmers market to chain stores. Thanks in large part to UC Santa Cruz alumnus Mark Lipson (Merrill, ‘81, environmental studies), American consumers today can better trust what they eat is organically grown and farmers know alternative ways to produce and market their crops. For more than 30 years, Lipson has diligently upheld the organic label’s integrity. He advocated for its acceptance in an era when organics was on the fringe and pushed for ethical standards when its boom was exploited. Lipson’s career has taken him from Santa Cruz to Washington D.C. and back again. He has returned to his UC Santa Cruz roots as a research associate with UCSC’s Center for Agroecology and Sustainable Food Systems, the first university program dedicated to teaching organic farming practices. Lipson has been an ambassador for the organic food movement since the early 1980s. 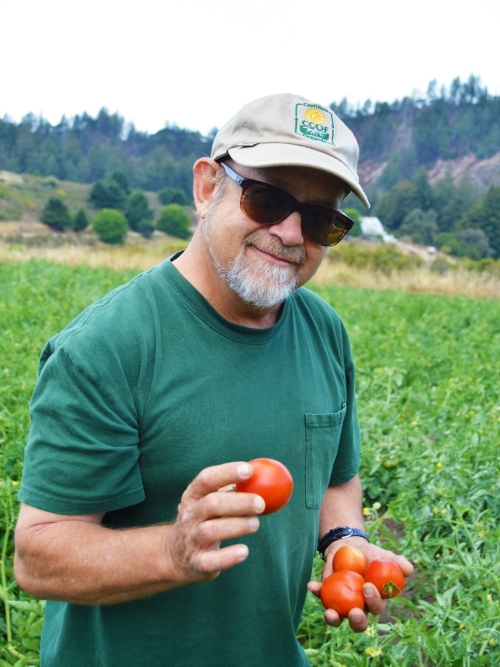 He was the first paid staff member at California Certified Organic Farmers (CCOF), based in Santa Cruz and now the largest organic certification organization in the country. He was also policy director at the Organic Farming Research Foundation, also based in Santa Cruz, that funds original research into organic farming methods. He then joined the U.S. Department of Agriculture as the country’s top organic and sustainable agriculture policy advisor, the first such appointment at that high a level. It all started in 1980 with a vegetable garden at the Merrill College provost’s house on the UC Santa Cruz campus. As a student, Lipson cultivated more than just a passion for gardening. He found allies with his neighbors, a group of young apprentices pioneering organic farming methods at the adjacent Alan Chadwick Garden. He picked up gardening advice, seedling starts, and new friends. These friends, affiliated with the UCSC Farm and Garden, became fellow co-founders of the Molino Creek Farming Collective, a farm they started in 1982 in the hills near Davenport, nine miles north of Santa Cruz, where Lipson lives today. When Lipson joined CCOF as its first staff member in 1985, the group’s standards were the de facto national standard because they were the only standard. But as Lipson came to realize there were many inconsistencies in the agricultural community of what was organic. As the industry boomed in the late 1980s, the label became widely used and abused, misunderstood and misappropriated. The marketplace was chaotic. Farmers were also at a disadvantage. “They were not on a level playing field,” he said. It was not until federal legislation and a set of regulations that Lipson helped pass, that the industry found consistency and transparency in organics. In 1989, Lipson pushed further the need to legitimize an organics food standard and institute a label that consumers could trust. He cold-called the U.S. Senate Committee on Agriculture and spoke with then junior staffer, Kathleen Merrigan (who later became the deputy secretary of agriculture in the Obama administration). He identified the problems the industry faced and explained the benefits for a standardized certification process. Receptive and inspired, Merrigan brought the project to Sen. Patrick Leahy, D-Vermont, the committee chair. With Merrigan and a large cast of organic farmers from around the country, Lipson helped draft a federal law to set national regulation for organic farming production and the “Organically Produced” label. The Organic Foods Production Act was passed in 1990 but not without controversy, especially when the USDA began to write the implementing regulations. “The first draft of the regulation was hugely rejected by the organic community,” Lipson remembers. He helped spearheaded a comment process that resulted in 275,000 public remarks, the most public commentary the federal government had received since the proposed regulation of tobacco as a drug. With help and support from Lipson and others, the rules were rewritten and finalized in the last days of the Clinton administration in 2000 and went into effect in 2002. This marked a pivot point for the organics industry. But it could not have happened without active involvement from the marketplace, Lipson says. “Getting the rules done was a huge lift, but unfortunately the need for research got left behind,” Lipson says now regretfully. The original draft of the 1990 law contained provisions for research funding but they were left out of the final bill. Lipson’s career turned to the need for scientific improvement of organic agriculture. From 1997-2010 he directed a policy program at the Organic Farming Research Foundation aimed at federal support for organic farming research. During that time, he and his colleagues built the case and won political victories to move federal research funding from essentially zero to over $20 million per year. “That’s a dramatic increase, but still a small fraction of the U.S. ag research budget,” he notes. As federal funding increased for organics in the U.S., so did Lipson’s involvement in government. From 2010 to 2014 he worked under Merrigan at the USDA in Washington. His job was to advocate for organics internally and educate policy makers in the department and on Capitol Hill. He chaired the USDA Organic Working Group, an internal communication and collaboration network with representatives from across the USDA. “There is a disconnect between policy professionals and what is really practical on a farm,” Lipson says. “There are actually very few farmers working inside USDA or in Congress.” Moving forward, he hopes to change that. While the organic movement has moved into mainstream consciousness, there is still a long way to go to advance organic farming methods, Lipson says. While consumers can advocate for change, he argues that the marketplace has limitations and the field needs more federal resources to explore new challenges and circumstances farmers now face.